Context is something we’ve been thinking a lot about at ScienceOpen recently. It comes from the Latin ‘con’ and ‘texere’ (to form ‘contextus’), which means ‘weave together’. The implications for science are fairly obvious: modern research is about weaving together different strands of information, thought, and data to place your results into the context of existing research. This is the reason why we have introductory and discussion sections at the intra-article level. But what about context at a higher level? Context can defined as: “The circumstances that form the setting for an event, statement, or idea, and in terms of which it can be fully understood.” Simple follow on questions might be then, what is the context of a research article? How do we define that context? How do we build on that to do science more efficiently? The whole point for the existence of research articles is that they can be understood by as broad an audience as possible so that their re-use is maximised. There are many things that impinge upon the context of research. Paywalls, secretive and exclusive peer review, lack of discovery, lack of inter-operability, lack of accessibility. The list is practically endless, and a general by-product of a failure for traditional scholarly publishing models to embrace a Web-based era. We’re continuing our series on highlighting diverse perspectives in the vast field of ‘open science’. The last post in this series with Iara Vidal highlighted the opportunities of using altmetrics, as well as insight into scholarly publishing in Brazil. 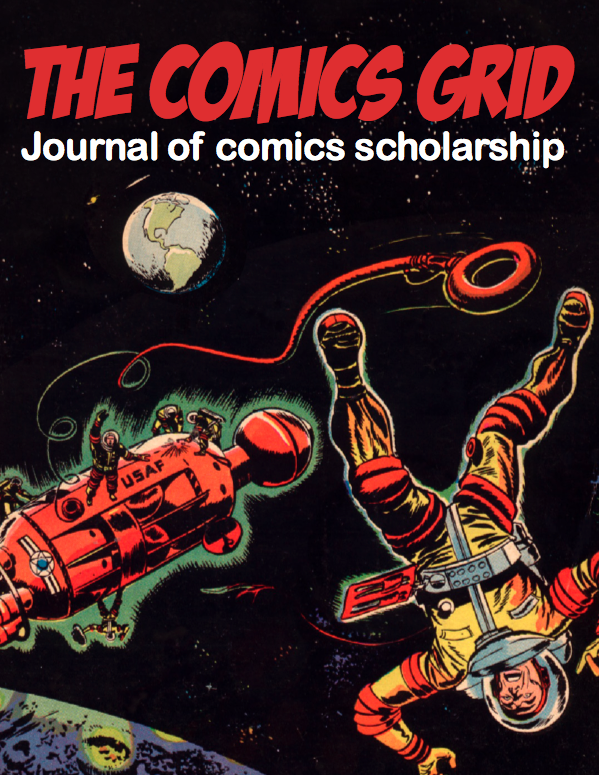 This week, Ernesto Priego talks with us about problems with the scholarly publishing system that led him to start his own journal, The Comics Grid. There was no real reason to not start your own journal as an academic, to regain control of our own work and to create, disseminate and engage with scholarship in a faster, more transparent, fairer way. Hi Ernesto! Thanks for joining us here. Could you start off by letting us know a little bit about your background? I was born in Mexico City. I am Mexican and I have British nationality too. I studied English Literature at the National Autonomous University of Mexico (UNAM) where I also taught and was part of various research projects. I came to the UK to do a master’s in critical theory at UEA Norwich and a PhD in Information Studies at University College London. I currently teach Library and Information Science at City University London. I cannot recall exactly. I think I first encountered the concept of ‘open access’ via Creative Commons. I was a keen blogger between 1999 and 2006, and I remember that around 2002 I first came across the concept of the ‘commons’. I think it was through Lawrence Lessig that I really got interested into how scholarly communications were incredibly restrictive in comparison to the ideas being discussed by the Free Culture movement. Lessig’s Free Culture (2004) changed things for me. (For more background I recently talked to Mike Taylor about why open access means so much to me in this interview). We need to think about the greater good, not just about ourselves as individuals. You run your own journal, The Comics Grid – what was the motivation behind this? Realising how difficult and expensive it was to access paywalled research got me quite frustrated with scholarly publishing. When I was doing my PhD I just could not understand why academics were stuck with a largely cumbersome and counter-intuitive system. The level of friction was killing my soul (it still does). It just seemed to me (now I understand better the larger issues) there was no real reason to not start your own journal as an academic, to regain control of our own work and to create, disseminate and engage with scholarship in a faster, more transparent, fairer way. I’ve said before that often scholarly publishing feels like that place where academic content goes to die: the end of the road. I feel publishing should be a point of departure, not the end. Higher Education Press (HEP) will be indexing one of their flagship Open Access journals, Frontiers of Agricultural Science and Engineering (FASE), with ScienceOpen, adding to our current archive of over 11 million article records. FASE is one of the leading Open Access journals in the fields of Agricultural Engineering, Resources and Biotechnology, Animal Husbandry and Veterinary Medicine, Applied Ecology, Crop Science, Forestry Engineering and Fisheries, Horticulture, and Plant Protection. By adding their content to ScienceOpen, they gain increased visibility through our platform and promotional services (like this article! ), which increases its value amidst a heterogeneous global publishing market. This cooperation between HEP and ScienceOpen helps to recognise the great work that Chinese publishers are doing to spearhead Open Access publishing, and our dual commitment to enhancing the visibility and impact of scholarly research in Engineering Science fields. What are we doing with the new content? Day 1 after releasing the Collection. For starters, the journal now has its own Collection! This means each article can be shared, recommended, peer reviewed, and commented upon, and as the content is all OA it’s easily discoverable and accessible via the publishers website. The advantage of this for HEP is that they gain lots of additional traffic to their content. What publisher doesn’t want that? This means more downloads, and more re-use of the research they publish, which in turn increases the quality and prestige associated with the journal brand. You can track the attention of the Collection easily via reader count aggregates, and altmetric aggregates, as seen here, as well as other measures of re-use. Researchers can now openly peer review and re-use their content too, which adds substantial value to both the research process and the journal brand again, which are both important in a scholarly publishing system that is becoming progressively more open. We’ll report the progress in these statistics again in a month so you can see the additional attention indexing with us generates! Biofuels and food security. A pretty important issue, I think we can all agree on! Another on protein and food security in China. Does air pollution affect food security in China? How does grain leave its water footprint around China? How to get high and efficient grain yield in rice. How much food is wasted in China? The genetic variation of Appaloosa horses from Argentina. This one has ‘gene knockout sheep’ in the title, and CRISPR. 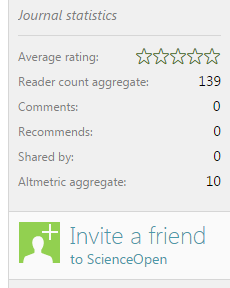 Indexing at ScienceOpen is a great way to enhance journal visibility and facilitate maximal re-use of research content. Last week, we kicked off a series interviewing some of the top ‘open ​scientists’ by interviewing Dr. Joanne Kamens of Addgene, and had a look at some of the great work she’d been doing in promoting a culture of data sharing, and equal opportunity for researchers. Today, we’re bringing you another open science star, Dr. Gal Schkolnik, who recently published a really cool Collection with us on the bacterium Shewanella. Here’s her story! Hi Gal! So can you tell us a bit about your research background, and how you originally got interested in science? I did my BSc in Chemistry at the Tel Aviv University and my MSc at the Weizmann Institute, analyzing the chemical composition of deforestation-fire smoke from the Amazon, where farmers and corporations yearly set hectares of rainforest on fire for agriculture and pasture. For my PhD at the Technische Universitaet Berlin I measured the electric fields at protein surfaces and self-assembled monolayers. Now I’m researching Shewanella, an electroactive bacterium that can transfer electrons across its outer membrane. As you can see, I always start on a completely new field, because my greatest passion in life is acquiring knowledge – so learning something new is my favorite kind of challenge. I’m basically just a kid who never got over the “why” stage, haha. Plus I had some very inspiring teachers at school – two wonderful women who nurtured my natural tendency to go deep in pursuit of answers to the hardest questions. People who have no access to journal subscriptions can use ScienceOpen to gain more knowledge about electroactive bacteria and their possible applications. The Zika virus is an international public health emergency, as declared early on in February by the World Health Organisation. As such, it is critical that the global research community help combat this threat as rapidly and efficiently as possible. This is a case when science can quite literally save lives. Recently, an article on the host-vector ratio in the Zika virus was published on the arXiv, a platform for articles often called ‘preprints’. This means that the work has not yet been peer reviewed, and is also not available to comment on the arXiv itself due to functional constraints. The paper is stuck in the hidden, timeless limbo of peer review until its eventual emergence as a paper or ultimate rejection. Give the pioneers a chance – Open Access and closing the reputational gap for young scientists. Over the last few months I’ve had the privilege of chatting to many young researchers from different areas of science. 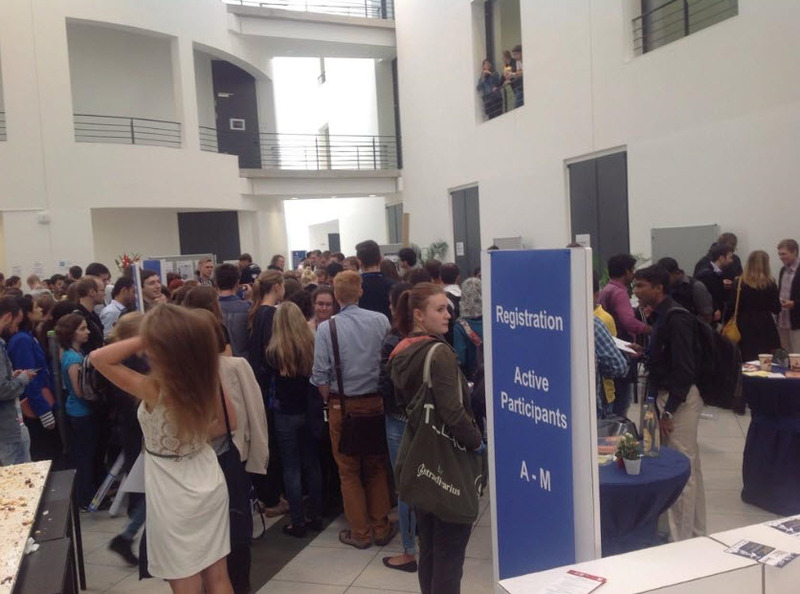 Last week, I was delighted to attend the 25th European Students’ Conference 2014 in Berlin where I had been invited to organize an afternoon workshop entitled Perspectives on Scientific Publishing with about 100 participants. It was terrific to spend almost three hours with so many students which were keen to find out more about the future of scholarly communication. My interest in this topic was sparked by a previous panel discussion on scholarly publishing when I observed that a significant part of the audience were Ph.D. students or post-docs. When one of the speakers talked about new opportunities in Open Access publishing, a very intensive discussion began. Almost all the young scientists in the audience were excited and motivated by the principles and vision behind Open Access. They said they would like to change the current publishing system and participate in a more open conversation about their research with peers. I was thrilled because that is what we are trying to develop at ScienceOpen. However, “If I publish my work Open Access, I will have difficulties in my future career, I am afraid, because I need the highest Impact Factor (IF) possible” said one of the young scholars, dampening the enthusiasm, and in the end most of his colleagues agreed. But how real is this risk for junior faculty who will have the most important impact on the future of academia? To find out more about the perspectives of grad students and junior researchers at institutions or universities, I tried to find arguments against active participation in Open Access publishing. Although younger researchers would like to have a public discussion about their science with their peers, almost everyone I talked to stressed that they have been instructed by their academic senior advisor to aim for a high-IF journal to publish their work. And most young scientists had the impression that there are relatively few quality Open Access journals and even many of these have a low IF, if any. Therefore I next asked some of their supervisors and professors for their thoughts. Amazingly, many of them emphasized that their graduate students and junior researchers themselves insisted on publishing in a “Champions League” journal, or at least, in a “Premiere League” journal with a high IF. Who was right? I believe that we don’t need to answer this question in order to understand why young researchers are wary of Open Access publishing opportunities. (A) To record and archive results. (B) To share new findings with colleagues. (C) To receive feedback from experts / peers. (D) To get recognition by the scientific community. (E) To report results to the public, funding bodies, and others. Next, let us analyze which reasons for publishing are more relevant to young researchers in comparison with others. Reporting results (E) is a more formal reason which is required when one has received a financial contribution by funding organizations. As for archiving (A), it is not a particular motivation for junior scientists. By contrast, sharing with colleagues (B) may have more significance for those groups that have just started to build up their academic network. We all agree that younger scientists must not only actively promote themselves by sharing new results of their work, but also to intensify dialogue with their peers. They therefore also depend on feedback from experts and peers (C) much more than a senior researcher who has established his or her expertise across decades. Both (B) and (C) will hopefully result in recognition from the scientific community and (D) has long been considered the conditio sine qua non in academia for all junior researchers if they want a successful academic career. Everyone I talked to agreed and most of my scholarly colleagues confirmed that this list appeared to be consistent and complete in describing the relevance of publishing for young researchers. But where are the Impact Factors in my list? Where are big journal brands? Until relatively recently, recognition has been largely measured by citations. Today, with more frequent usage of social networks, we should broaden our view and associate credit for scientific work also with mentions, likes, or retweets. The latter attributes of modern communication in social networks is an immediate and uniquely fast way to provide and earn credit in scholarly publishing. There are an ever increasing number of examples where an excellent paper was recognized within minutes after it had been published Open Access. Citations are important, but it is the article and the individuals who authored that work which should get credited. And there is growing evidence that papers published Open Access are read and ultimately cited more often. Impact factor is a “toxic influence” on science, as Randy Shekman, Nobel laureate and founder of eLife recently stated,. Finally, we do not need big journal brands or an Impact Factor to evaluate the relevance and quality of research. Neither for senior scientists, nor for young researchers. The latter group, however, has a significant intrinsic advantage: they are much more accustomed to communicating with social media tools. If they continue to use these when starting their academic career, they will strongly influence traditional, old-fashioned ways of crediting academic research. Liz Allen, who works with me at ScienceOpen, also recently wrote this blog post to encourage younger researchers to be part of the open scientific conversation and suggested different ways for them to get involved. It will be your generation in a decade from now that will craft the careers of other young researchers. Nobody else. Therefore you should not be afraid of publishing Open Access or submitting your next paper to an alternative open science platform. The more people like you who follow that path of modern scholarly publishing, the less emphasis will be put on classical incentives for academic evaluation. Open Access and active communication about new results in science by social media and open science platforms, such as ScienceOpen, can increase both usage and impact for your work. And my request to senior scientists who are presently judging the quality of the younger generation of researchers: challenge yourself to look at their social networking record and their willingness to shape the new measures of recognition. And do not forget: Access is not a sufficient condition for citation, but it is a necessary one. Open Access dramatically increases the number of potential users of any given article by adding those users who would otherwise have been unable to access it, as Stevan Harnad and Tim Brody demonstrated already 10 years ago. Give the pioneers a chance – they are the future of research! ScienceOpen – making publishing easier. Why publish? Publishing with ScienceOpen, the new OA research + publishing network, is a bit different and quicker from what researchers may have experienced elsewhere! Here’s a short video that explains how we make publishing easier. Q. For busy researchers & physicians, time is short, so why bother to publish with ScienceOpen? A. So you can share your results quickly and get back to your research. At ScienceOpen, we understand that the publishing process is all too often painful and time consuming. This picture demonstrates why rapid and informal web publishing plus Post-Publication Peer Review could well be the future! ScienceOpen strives to offer services to researchers for a price ($800) that is significantly less than most OA journals. Full and partial fee waivers are available to those in need in low and middle income countries and in less well funded disciplines. Welcome to the next wave of Open Access Publishing. Join us today.